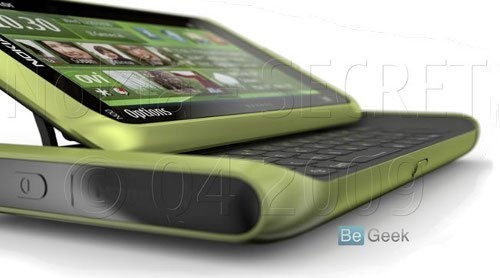 Did the N8-01 with QWERTY just get leaked? Important: As Tom has already mentioned in the comments section, please take it as humor only post and not some official\unofficial leak. I’ve already explained that this may not be a Nokia at all. My point is mainly not about the ‘leak’, its about other things that I have gone through in the later section of the post. Thanks to @mlymehta, we got reported of something special which happened today. Nokia’s PR agency, WOMWorld/Nokia had posted the below pictures on one of their blog posts, though they removed the same after a while, after a couple of reports. But yeah, a few were quick enough to take screenshots of the same like the one given below. If you think that’s an E7-00, you’re wrong. Apart from the apparently lower screen size, the most prominent difference would be the 3-Rw QWERTY in this, compared to the 4-Row QWERTY of the Nokia E7-00. By the way, the image would’ve originated from www.nokiasite.net possibly. Some more closer examinations will make you notice that its not a Nokia or Symbian^3 at all. Check out the cheap kind of pop out buttons and especially, a red End-Call button at the bottom of the screen. Moreover, the picture was not clear enough to zoom through, but the name mentioned at the top left corner certainly clarifies that it’s not an E7, not at all. Moreover, this one doesn’t seem to be having the same level of thickness as the Nokia E7, but a little more than that and neither does the slider mechanism seem so. Conclusion: This is certainly not a Nokia, not the E7, N8-01 or any other device (Nokia has been producing much better keys than this one). 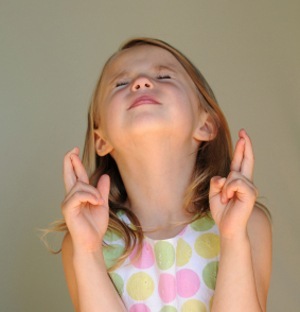 When reference platform for N8 was Cortex 8 then why last minute changes to bring a non-Cortex in? 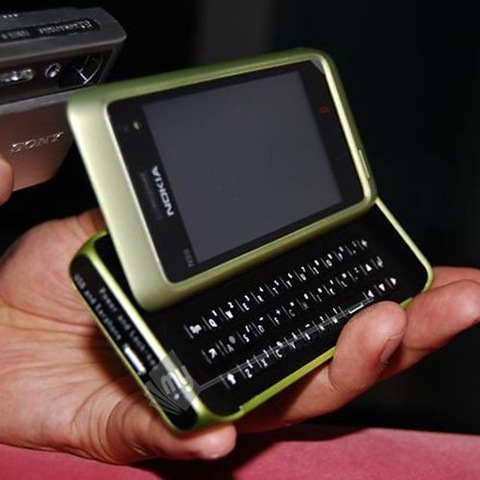 Why can’t we have a device with 4” screen and qwerty like Nokia E7 and imaging like Nokia N8? Why N8 couldn’t come with a CBD when C6-01 can? Even if CBD was in shortage then, why not bring a CBD version of N8 now? Samsung already doing so. Why was N8 given a 512 mb ROM when E7/C7 or even C6-01 was given 1Gb ROM? Flagship? Why E7 can has a hot swap SIM but N8 not? Why C7 can has a NFC chip inside and N8 not? They have chips since 2001. Why, why, why a 4” should stay with 1200 mAh? Is 6 hours a norm or something? 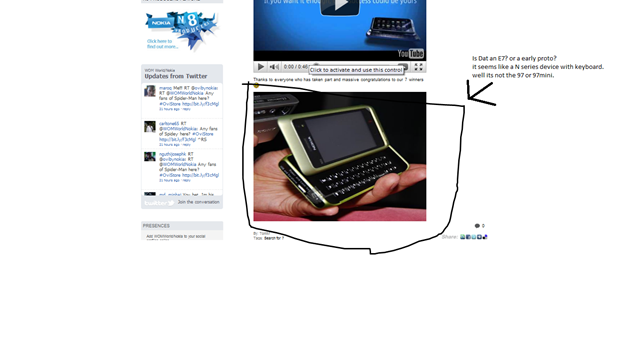 Remember the below mentioned leak picture long back when it was being called as Nokia N98 or something and later came out to be Nokia E7 2-3 years later? If you look closely over the pictures (that was a concept design actually back then), then you find 5-6 home screens dots rather than three as we see now days. Did Nokia compromise over the software due to inferior hardware? At the end, how many of you might be buying something like Nokia N8-01, which may come with QWERTY and same imaging level as Nokia N8 or even if something in 8MP at level of Nokia N86 with variable aperture etc? I guess in that case, users will easily pay a price like N8 because of HW QWERTY itself even if they keep it a 3.5” again. What’s say? Is Nokia planning to release one like this? i doubt there is phone like e7 but with imaging like n8 from nokia anytime soon.